Home » Faze or Phase: What’s the Difference? Words that sound the same but mean different things are difficult to master when learning a new language. These words are called homophones, and like every language, English has many of them. Faze and phase are two common homophones in English. They are pronounced identically, but in writing, they can never be substituted for each other. Continue reading to find out why. Faze vs Phase: What’s the Difference? In this article, I will compare faze vs. phase. I will use each word in an example sentence to properly illustrate its meaning and context, and I will discuss a useful trick to help you decide whether to use faze or phase in your writing. What does faze mean? Faze is a verb and is defined as to intimidate or perturb. The word is often negated; someone who is undaunted by a challenge is said to remain unfazed. See the sentences below for examples. The enemy’s numbers did not faze the experienced general. Jeremy looked at all the challenges that lay before him, but remained unfazed. What does phase mean? Phase can be a noun or a verb, in both of which cases it carries multiple meanings. In one of its noun senses, it means one part of a process, where it is roughly synonymous with stage and chapter. The third phase of my travel plans includes two months in Europe. In zoology, a phase is a color variety of an organism or a stage in an organism’s metamorphosis or development. See the following sentence for an example. The larva entered its pupal phase before emerging as an adult. In astronomy, lunar phases are cyclical shapes illuminated on the surface of the moon by the light of the sun, as observed from the surface of the earth. The sentence below is an example. The moon is entering its waxing gibbous phase. Phase can also be a verb. As a verb, it is a synonym of transition. See the following sentence for an example. We’re going to phase out paper documentation for all departments as we move to digital-only records keeping. Here is a helpful trick to remember phase vs. faze. If you’re using the word as a noun, choose phase. Faze is never a noun. As a verb, if you mean to intimidate or worry, use faze. In other instances, choose phase. You can remember to use faze as a synonym for daunt since it starts with the same letter as the word fret. Someone who is fazed does a lot of fretting, so it should be easy for you to keep these words straight. Is it faze of phase? While these two words are pronounced the same, their meanings are in no way related and they aren’t interchangeable in any sense. Faze is a verb that means to intimidate or daunt. Phase can be a noun, where it means a distinct stage in any of several processes, or a verb, where it means to gradually transition. You can remember to save faze for situations where someone is worried since faze and fret both begin with F.
Homophones can be confusing, but now you will always know whether to choose phase or faze in your own writing. 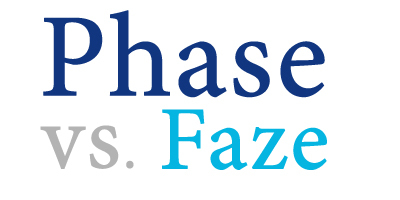 1 Faze vs Phase: What’s the Difference? Maize vs. Maze: What’s the Difference?